In an effort to increase awareness about the dangers associated with Metabolic Syndrome, Health News Wires is giving away their $19.99 e-book for free for a limited time. The new e-book defines metabolic syndrome and shares tips to lose weight, lower blood sugar and prevent risk factors associated with the dangerous condition. Free for a limited time, the Metabolic Syndrome: Breaking the Cycle free e-book and video from Health News Wires share important details about metabolic syndrome, a preventable health condition that affects over 70 million people. The new e-book provides the exact definition of metabolic syndrome and details important information, tips, and techniques to avoid metabolic syndrome and lower the risk of diabetes, obesity and heart disease. Metabolic syndrome is not just one disease, rather a result of a combination of several unwanted health conditions, including a combination of insulin resistance, cardiovascular disease, hypertension, high cholesterol, and obesity. The more of these dangerous risk factors present, the greater one’s risk of metabolic syndrome. Metabolic syndrome affects nearly 40 percent of the population and is one of the fastest-growing conditions for males between the ages of 30-50. The increased risk of heart attack, stroke, and diabetes caused by metabolic syndrome increases the risk of early death for the nearly 70 million people currently affected by the condition. Some specific risk factors of metabolic syndrome include being overweight, lack of exercise and poor diet. A complete list of risk factors, as well as tips to prevent these risk factors, is available in the new downloadable e-book from healthnewswires.com. Diagnosed when three or more determining risk factors are present, metabolic syndrome is a preventable and treatable condition. Specific ways to treat and prevent the condition that readers can start at home are also detailed in the new release. 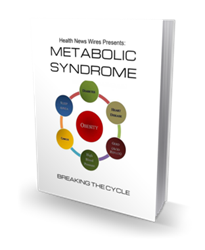 The Metabolic Syndrome: Breaking the Cycle Report is availabimprovedle for a limited time at http://healthnewswires.com/metabolic-syndrome-ebook. Health News Wires is also giving away a free e-book that shares the most effective ways to lower blood sugar and improve fat loss. The 31-page book shares the most effective diet and exercise tips to improve blood sugar levels and increase insulin sensitivity. The complete e-book is available for download at: http://healthnewswires.com/improved-blood-sugar-levels/. About: HealthNewsWires.com is a new site that was launched in June of 2013 in order to educate the community in the importance of health and wellness. Previous topics covered on the site include Insulin Resistance; upcoming topics to be covered include weight loss, benefits of antioxidants, skin health, joint health, metabolism, digestive health, probiotics, gluten intolerance, cleansing diets, heart health, as well as several other highly informative articles to help people understand the connection between health and a high-quality of life. Most recently, they released a video explaining how to Naturally Reduce Dangerous Inflammation.